White Stuff Green Floral Dress Two Front Pockets,Size 8. Very Good Used Condition. Ladies Blue/green Checked Tunic Dress By Mantaray, Size 20, Gc. Condition is Used. Dispatched with Royal Mail 1st Class. Lovely TUNIC DRESS. Good clean EXCELLENT CONDITION. Soft Roll Neck. Cotton Mix. ladies dress size 16 with elasticated waist new without tags. ladies dress size 16 with elasticated waist new without tags.. Dispatched with Royal Mail 2nd Class. ZANZEA Womens Lagenlook Turtle Neck Casual Tunic Shirt Dress Kaftan Plus. Condition is New with tags. Size is upto 20 Measurements armpit to armpit 24" Dispatched with Royal Mail 2nd Class. Laura Ashley Victoriana Pink Vintage Style Long Floral Maxi Dress Size UK12. Worn once, in excellent condition. Dispatched with Royal Mail 2nd Class signed for. Joe Browns Cosy Warm Roll Neck Black Dress Size UK 8. Only worn a couple of times and is in excellent condition. From a smoke-free house. Any questions then please just ask.I can dispatch this dress within 2 working days using Royal Mail 2nd Class Delivery. Please get in touch if you'd like another postage option.Thanks for looking! Navy blue with a floral and peacock pattern. 3/4 sleeves and a wide roll neck. sits just above the knee. 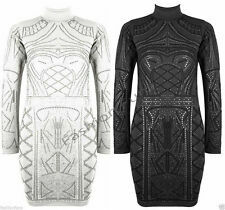 Shikka London Grey Roll Neck Dress Size 8-10. Only worn a couple of times and is in excellent condition.From a smoke-free house. Any questions then please just ask.I can dispatch this dress within 2 working days using Royal Mail 2nd Class Delivery. Please get in touch if you'd like another postage option.Thanks for looking! Women Fashion tunic. Dispatched with Royal Mail 2nd Class. Modest Victoriana style. Laura Ashley size 14. Floaty chiffon style material. Attached scarf. EU size 46, I believe this is a UK 12. Eden rock made in Italy oversize Tunic Top Size XXL 54" bust " excellent "
Unusual and trendy dress by Sacks fashion. Grab a bargain. Very good quality 100% lyocell brown dress. High neck and wide sleeves. Unlined, light and comfortable. Size is 4, which would be 12-14. Beautiful ladies dress by G-Heaven. Navy velvety dress with a black mini beaded pattern. Black 95% wool mix dress. with a roll neck and button pocket detail to the front. hidden zip up the back of the dress. knee length. This is a heavy feel dress a sign of top quality. shoulder to hemline approx: 35.5". 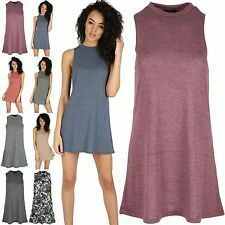 Noisy May Geometric Grey Asymmetric Polo Neck Sleeveless Dress Size M. Belt not included. Lenght( longest side) 46in, pit to pit 20in. Grey camouflage dress with cowl roll neck from Alyn Paige. Perfect for the Winter. beautifully soft with cowl roll neck to keep you warm. 96% Polyester 4% Spandex.